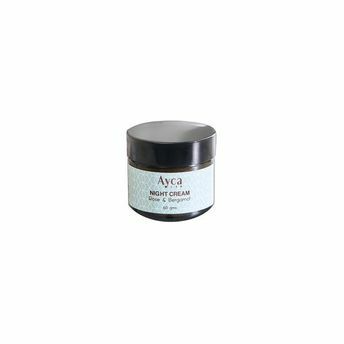 Ayca Rose and Bergamot Night Cream is an enriching night cream made from a specially formulated combination of beeswax and the essences of herbs, woods and flowers. It is a deeply nourishing and rejuvenating formulation which heals blemishes and reduces fine lines and pigmentation while preventing other signs of ageing. Suitable for Normal/Dry and Mature skin types. Essential Oil of Bergamot & Rose in an aqueous extract of Bay & Margosa (Neem) Leaf, Cinnamon & Cupressus Bark & Globe Thistle Flowers, Wheat Germ, Jojoba, Grapeseed, Almond & Lemon Oils in a plant derived base of Stearic Acid, Polysorbate & Glyceryl monostearate with Beeswax. Alternatively, you can also find many more products from the Ayca Rose & Bergamot Night Cream range.